Important: Control of barcode scanning hardware is exclusive. When DataWedge is active, Scanner and Barcode APIs of apps such as Enterprise Browser and others will be inoperative. Likewise, when an app such as Enterprise Browser controls the scanning hardware, other apps (including DataWedge) are locked out. It is therefore important to understand how to take control of a device's scanner hardware and, if necessary, release it to other apps when scanning is complete. For more information, see Disable DataWedge section. A DataWedge Profile contains information about how DataWedge should behave with one or more associated applications, and provides a means to allow different apps that might be acquiring the same data to do different things with it. For example, while "App A" might require that a TAB be sent after each dataset is passed from DataWedge, "App B" might require the ENTER key to be pressed instead. Through Profiles, DataWedge can be configured to process the same set of captured data according to the requirements of any number of individual applications. Alternatively, a single Profile can be created and associated with many applications, acquiring and processing data in exactly the same way for all. Any number of Profiles can be created to suit all the needs of an enterprise. DataWedge also includes several pre-configured Profiles to support general needs or for specific apps that are built into every device. Some of these, such as Profile0, are visible to the user and can be edited as needed. Others contain fixed parameters and are not visible or configurable. 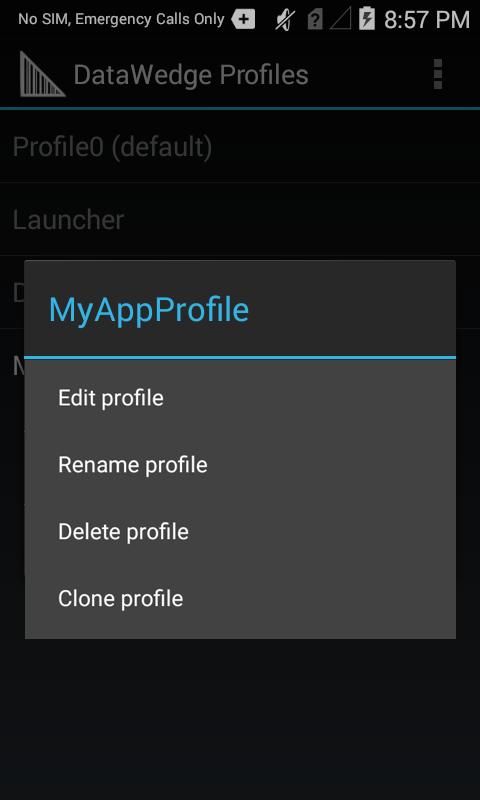 Profile0 - is a generic that takes effect for any unassociated foreground app. 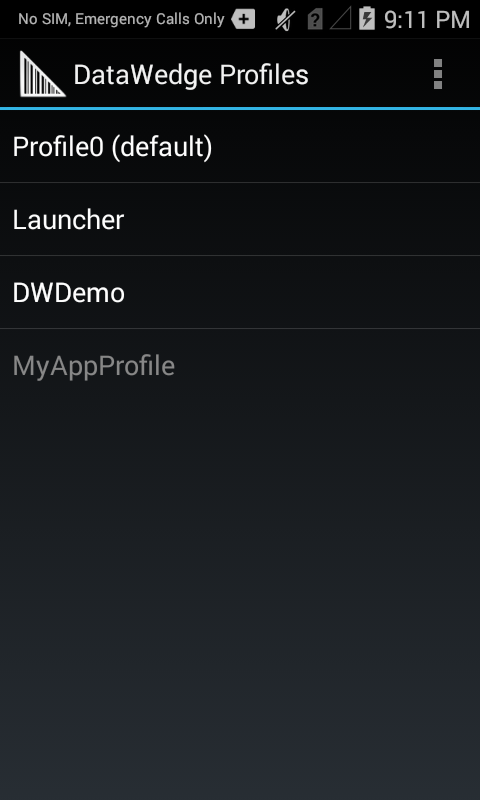 Launcher - is used when the Launcher screen is in the foreground. DWDemo - is used with DWDemo, the DataWedge Demo app app. When DWDemo comes to the foreground, data captured with DataWedge is handed to the DWDemo application. User-defined - profiles are always visible and available for editing. RD Client - provides support for Zebra's Rapid Deploy app and third-party MDM solutions. MSP Agent - provides support for Zebra's legacy Mobility Services Platform (MSP). MspUserAttribute - provides additional support for MSP. Camera - disables scanning when the default camera application is in the foreground. RhoElements - disables scanning when RhoElements is in the foreground. Profile0 is a generic Profile that automatically takes effect for any app that comes to the foreground that has not been associated with DataWedge. This can be useful for quickly acquiring data using an app that has just been installed, for example, or when using an app that has not yet been configured by an administrator for use with DataWedge. All parameters of Profile0 can be edited except its association. 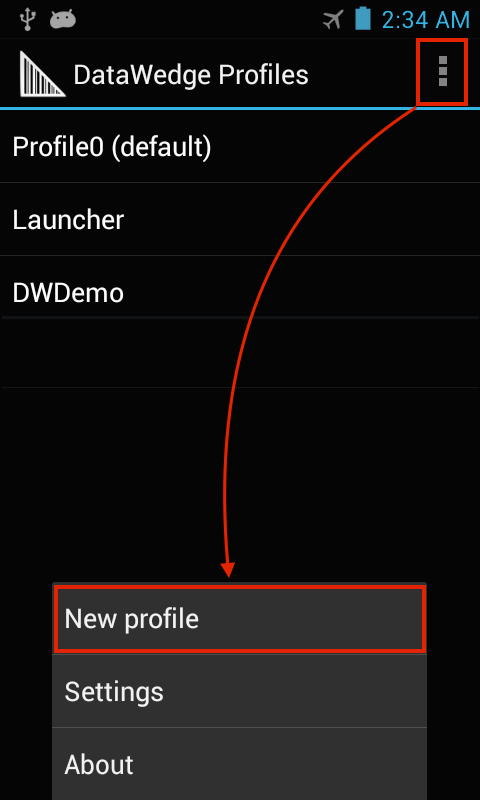 Profile0 also can be disabled within a Profile. This provides a measure of security by restricting output to applications or servers to which DataWedge has been specifically associated. Plug-ins extend DataWedge functionality to support device hardware, peripherals, data processing and transport. Plug-ins are used to configure how data will be acquired by DataWedge, manipulated or altered for an app, and output to an app or server. Input Plug-ins specify the device hardware to be used to acquire the data before sending it for processing. Those included with DataWedge are explained below. DataWedge also provides beep sounds and other feedback to alert the user of scanning results and barcode type. Refer to Scanner Parameters section for more information. The Barcode Scanner Input Plug-in reads data from the integrated barcode scanner built into the device, attached by cable or implemented as a snap-on module. This Plug-in supports laser, imager and internal cameras. The raw barcode data that's acquired is processed or formatted as required using Process Plug-ins. The MSR Input Plug-in is for magnetic stripe reader modules. This plug-in reads data from an integrated MSR reader or attached Scan/MSR Module, after which the raw data from the reader can be processed or formatted as required using Process Plug-ins. The SimulScan Input Plug-in permits simultaneous capture of barcodes, images, text, signatures, phone numbers and other data on multi-part forms. The SimulScan Input Plug-in adds this capability to DataWedge. When form data is captured according to a designated SimulScan template, data can be processed or formatted as required using Process Plug-ins. Note: DataWedge concatenates all text captured through SimulScan into a single string, and performs processing on the concatenated string. See SimulScan section later in this guide. Process Plug-ins manipulate the acquired data in a specified way before sending it to the associated application or server via the Output Plug-in. Process Plug-ins are grouped with each Output Plug-in, and appear as "Basic Data Formatting" and "Advanced Data Formatting." They are explained below. The Basic Format Process Plug-in allows DataWedge to add a prefix and/or a suffix to captured data before passing it to an Output Plug-in. 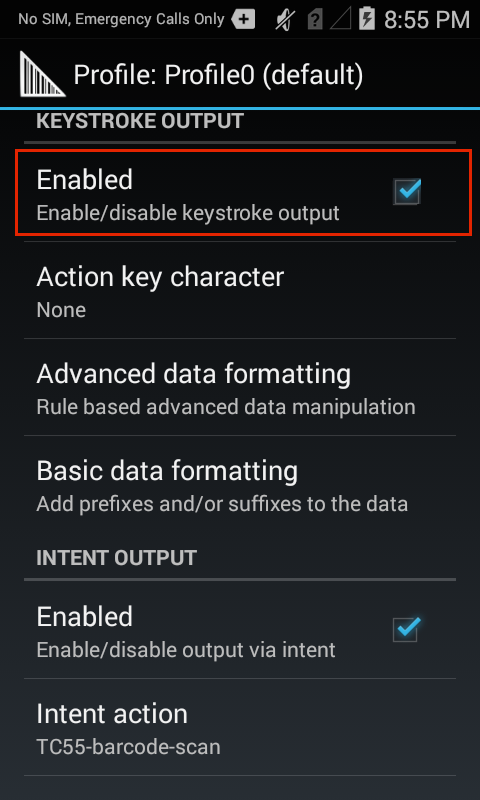 It also permits the insertion of TAB and ENTER keystrokes as well as conversion of data to hex. For example, if the acquired barcode data is 012345, this option would cause the hex equivalent data of 303132333435 to be sent. The Advanced Format Process Plug-in allows for acquired data to be customized to suit any requirement based on a set of complex rules containing individual or multiple criteria and actions. For more information, please see the Advanced Data Formatting Guide. Output Plug-ins send the processed data to the associated application or server. Those included with DataWedge are explained below. The Keystroke Output Plug-in collects the processed data and sends it to the associated application as a series of keystrokes, emulating the actions of a user pressing the keys. 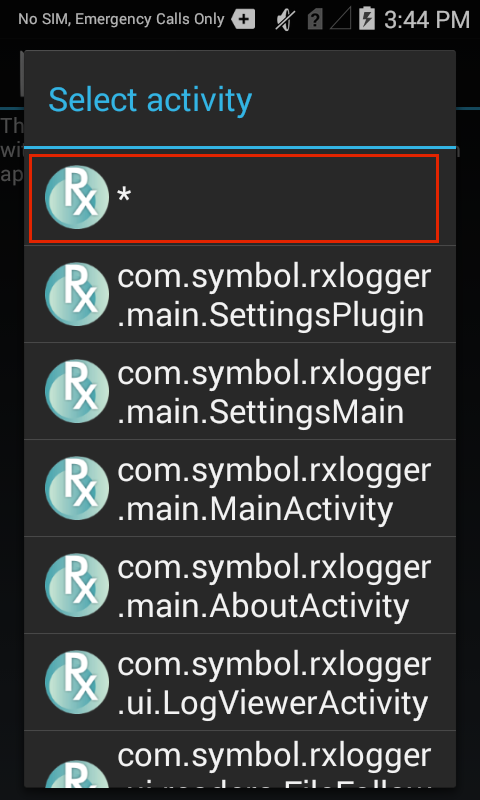 The Intent Output Plug-in sends the processed data to the associated foreground application as payload within an Android Intent. The IP Output Plug-in allows captured data to be sent to a specified IP address and port using either TCP or UDP transport protocols to a Windows server running Zebra IPWedge software. Please refer to the IP Output Guide for further information. This section provides step-by-step instructions for creating a DataWedge Profile, which includes plug-ins for input, processing and output, plus association with an app. Use these steps for every app that will call on DataWedge for scanning services. On newly installed devices, the DataWedge Profiles screen similar to the image below appears, showing the three included (visible) Profiles. White text indicates enabled Profiles. Also shown is a fourth, disabled Profile (grey text) that's not present out-of-the-box. Note: If DataWedge had been opened previously, it will reopen to the last screen used. If necessary, press BACK until the Profiles screen appears. 2. Tap the "hamburger" menu and select -> New profile. 3. Enter a name for the new Profile and tap OK. The Profiles list appears, similar to the image in Step 4, below. Zebra recommends that Profile names be unique and contain alpha-numeric characters only. 6. Tap the menu and select -> New app/activity. A list appears with all apps and activities installed on the device. 7. 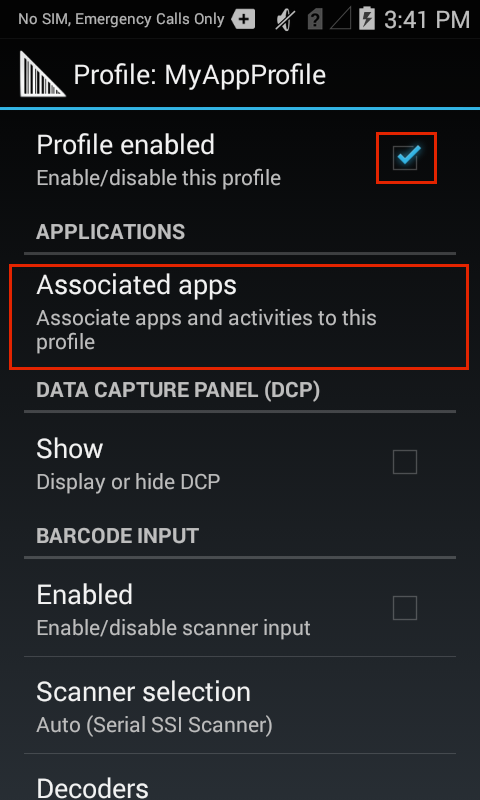 From the device apps/activities list, select the app or activity to associate with the Profile being edited. 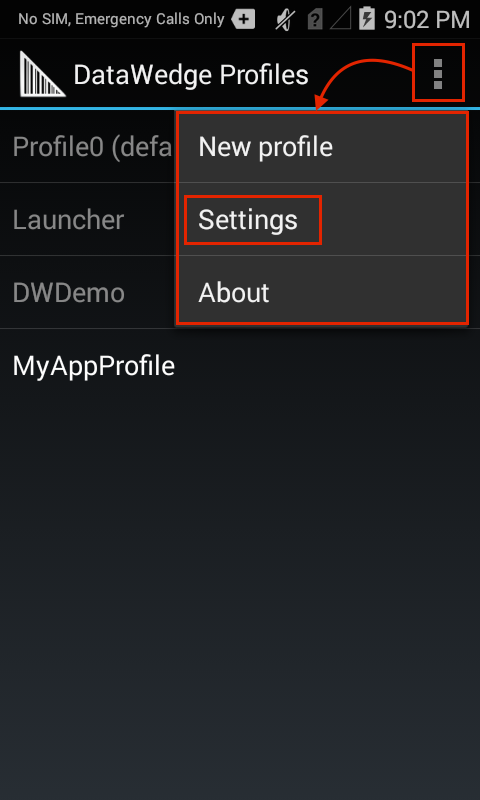 When an app is selected, its activities list appears (see Step 8). 9. 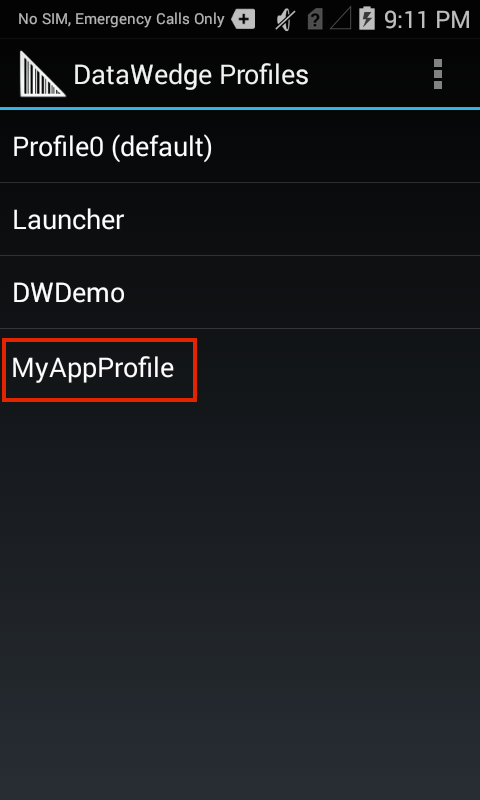 The app now appears in the Profile associations list as below. Repeat Steps 6-8 until all desired apps and/or activities are associated. When finished adding associations, Tap the BACK button to return to the Profile screen. 11. From the Scanner selection screen, select the desired scanner or imager. Tap BACK to return to the Input Plug-in screen. Note: Lists such as the one above display only devices that are present on (or connected to) the unit being configured. 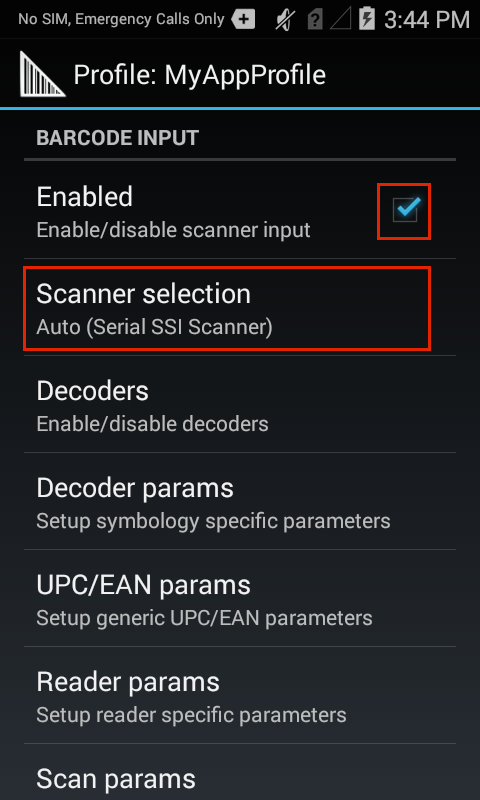 For related information, see Scanner Selection section. 12. From the Decoders screen (accessible from the Input Plug-in screen), select only the decoders required by the application to optimize scanning performance. Tap BACK to return to the Input Plug-in screen. For more information about configuring Decoder parameters, see the Decoder Guide. 13. From the Profile screen, select the desired Output Plug-in (scrolling down as necessary). For example, the image below shows that the Keystroke Output Plug-in is enabled: Note: Output Plug-in sections contain selectors for configuring "Basic data formatting" and "Advanced data formatting." These are the Process Plug-ins. See Basic data formatting elsewhere in this guide for more information. For Advanced data formatting options, see the Advanced Data Formatting Guide. 1. 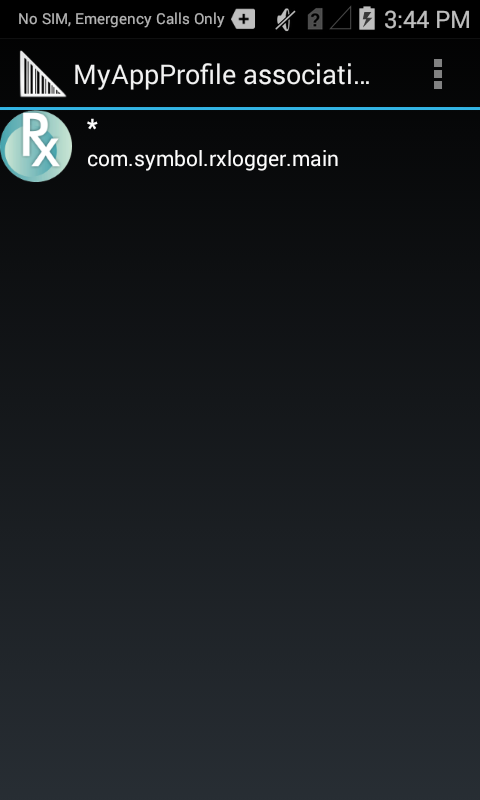 Long-press the Profile name to bring up its Context menu. 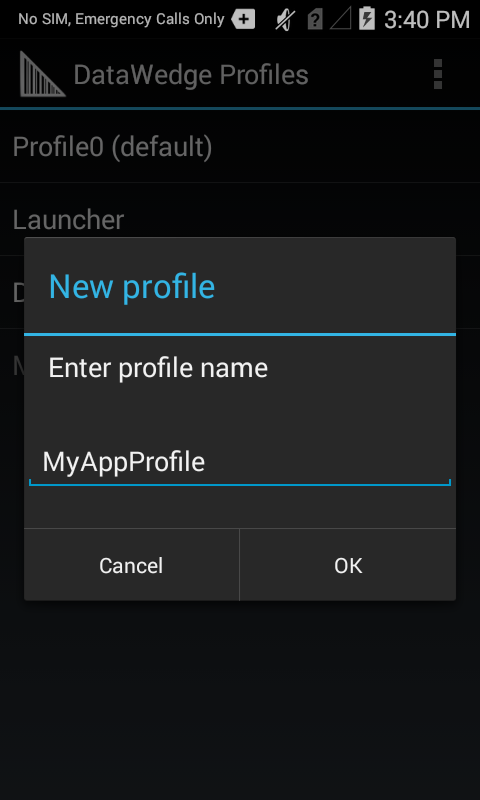 Editing a Profile also can be started by tapping the Profile name in the Profile list. Control of barcode scanning hardware is exclusive. When DataWedge is active, Scanner and Barcode APIs of apps such as Enterprise Browser and others will be inoperative. Likewise, when an app such as Enterprise Browser controls the scanning hardware, other apps (including DataWedge) are locked out. It is therefore important to understand how to take control of a device's scanner hardware and, if necessary, release it to other apps when scanning is complete. 1. Start DataWedge and navigate to the Profiles list (if not shown by default). 3. Uncheck the "DataWedge enabled" checkbox. Control of scanner hardware is now returned to the system. 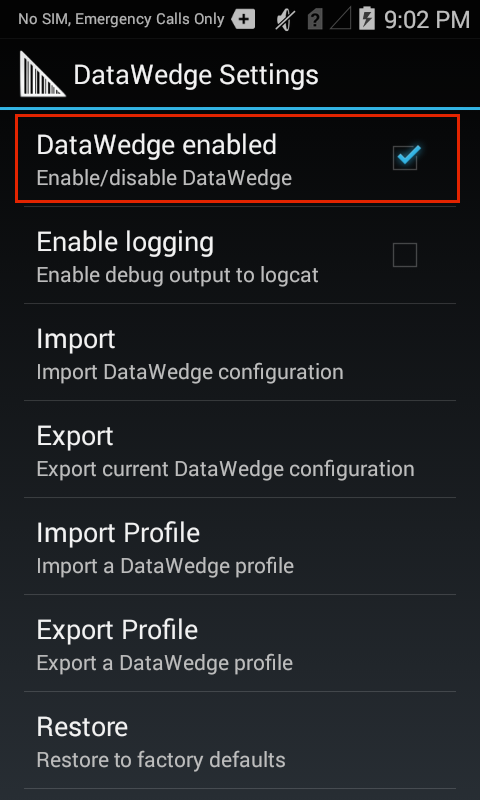 The DataWedge Settings panel controls Profile import/export, logging and other general functions. For more information about functions of the DataWedge Settings panel, please see the Advanced Guide. For the Barcode Input Plug-in, the Scanner selection panel determines which scanning device will be used for data capture. The list of available scanners will be based devices that are present on (or connected to) the unit being configured. The "Auto" option will automatically determine the best scanning device from the list of available devices based on the rules below. If a Zebra Scan Module or Scan/MSR Module is installed, the 2D imager will be selected. If no Scan Module is installed, the camera will be selected. When the camera is selected, scanning is performed with the rear-facing camera. When 2D Imager is selected, scanning is performed using the installed Scan or Scan/MSR module. To initially configure the RS507 in a Profile, the scanner must be paired and connected. 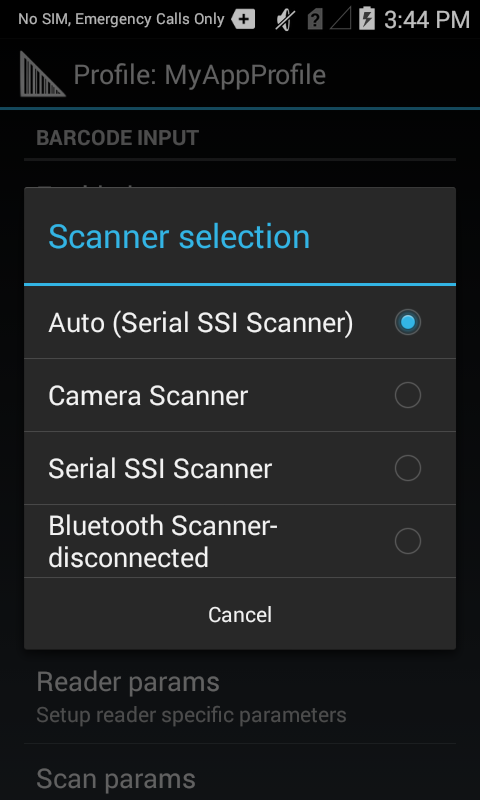 After initial configuration, the Bluetooth scanner can be enabled and disabled in the Profile even if it is disconnected from the device. However, to configure reader parameters, decoders and other scanner settings, the Bluetooth scanner must be connected. 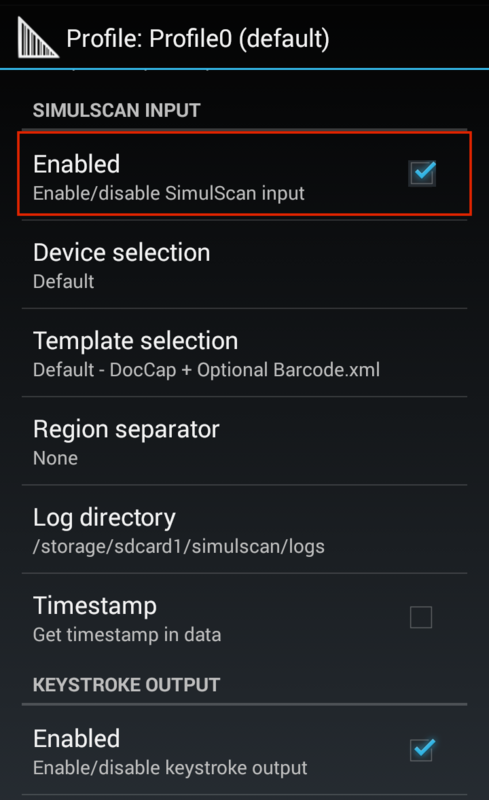 DataWedge will not automatically reconnect to a Bluetooth scanner if that scanner is connected while DataWedge is using a different auto-selected scanner. 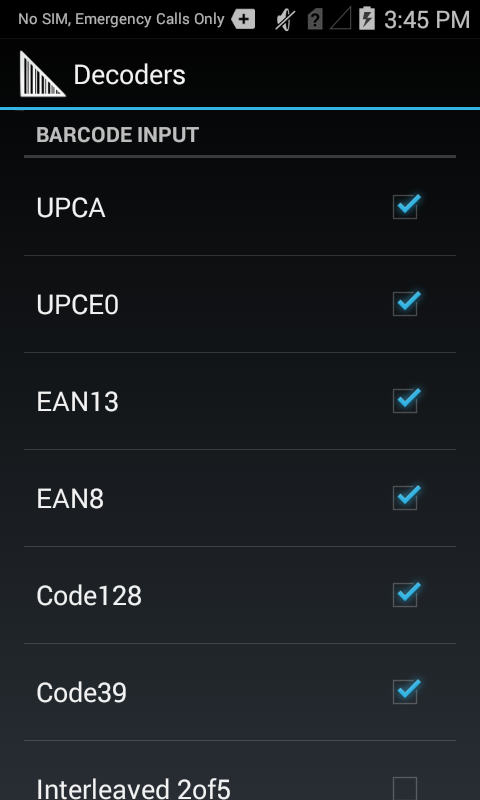 To re-enable a Bluetooth scanner, connect the scanner and select it in the Profile or re-choose the Auto select option. Auto-selection and Battery Swap - If Scanner selection is set to Auto and the RS507 was enabled prior to a battery swap, DataWedge will continue working with that RS507 scanner upon reconnection after the battery is swapped. If the RS507 does not reconnect with after the swap, DataWedge will revert to the current default scanner. Keep Enabled on Suspend - This mode is supported only on the RS507. When the RS507 trigger is pressed, the device will wake from suspend mode. 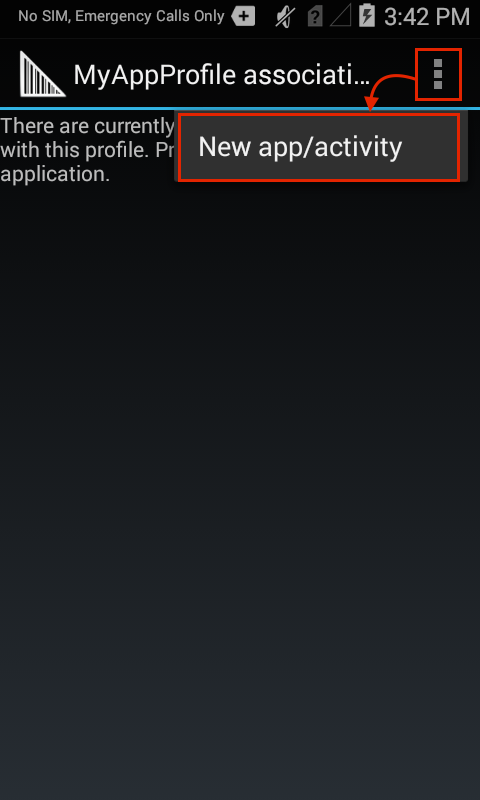 Note: This option could cause faster device battery drain while in suspended mode. Text captured through SimulScan is concatenated into a single string, and processing is performed on that string. If the Barcode Input Plug-in is enabled in a Profile, enabling SimulScan in that Profile will cause the Barcode Input Plug-in to be disabled. Device Selection - permits selection between the device camera or the default scanning device set by the system. Template selection - sets a SimulScan template for the Profile being configured. 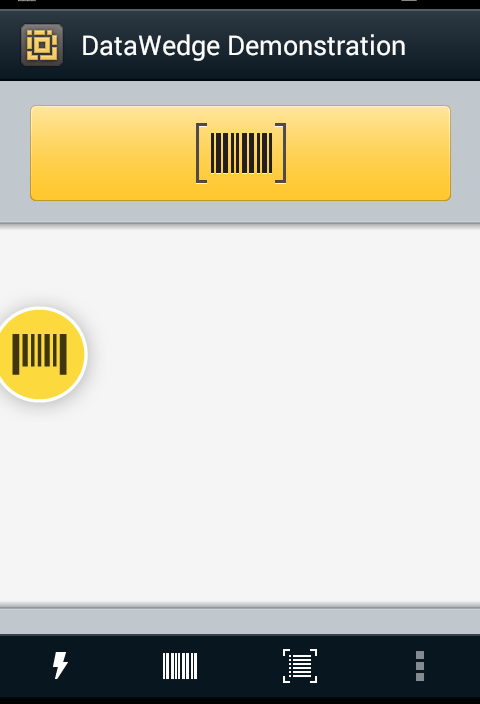 DocCap+Optional-Barcode.xml - captures the form as an image and optionally decodes a barcode if present. This is the default form if none is selected. 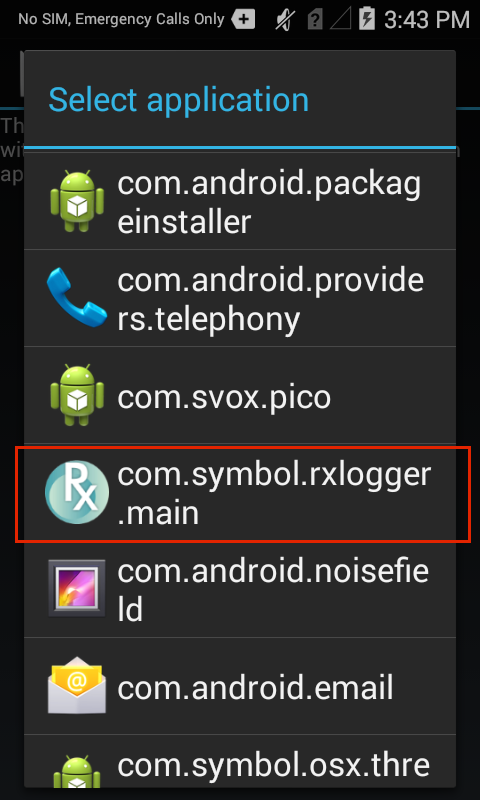 Note: Files and folders within the /enterprise directory are invisible to Android File Browser by default; they can be made visible by manually inputting the path. Partners and other authorized users can create custom templates online using Zebra's SimulScan Template Builder. Region separator - is used to configure a separator character for SimulScan text-region data. When multiple text regions exist, the region separator will be inserted between the data strings from each region on the acquisition form. Region separators can be used with the Keystrokes Plug-in Action key character setting (see below) to dispatch SimulScan region data to separate text fields. Barcode, OCR and OMR regions are considered as text regions. When using keystroke output and IP output, only text-region data will be dispatched to the foreground application or the remote server. Picture-region data can be retrieved only through the Intent Output Plug-in. Action key character - enables injection of a special character embedded within barcode or MSR data. The Basic Format Process Plug-in provides an easy way to append or prepend acquired data with custom values or keystrokes before passing it to an Output Plug-in. It also permits the conversion of data to hexadecimal format. If the Basic Formatting Plug-in is not enabled, captured data is passed to the selected Output Plug-in without modification. Basic Data Formatting Output Plug-in options. 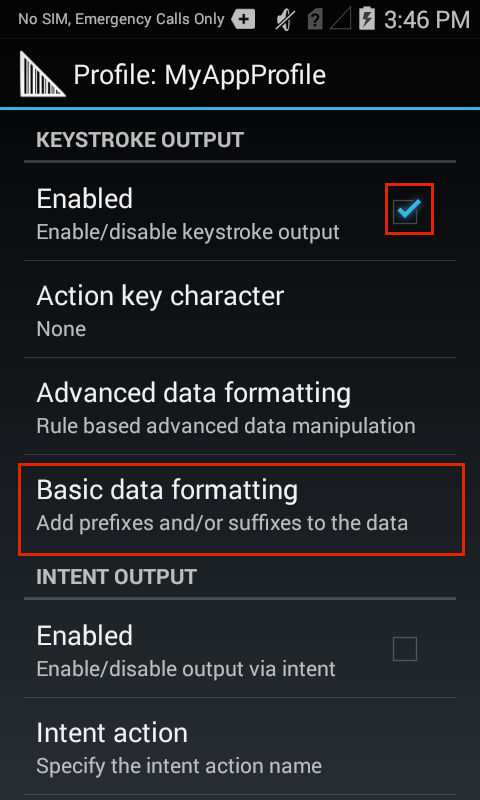 Prefix to data - adds (prepends) the specified characters(s) to the beginning of the acquired data before sending. Suffix to data - adds (appends) the specified characters(s) to the end of the acquired data before sending. Send data - Enabled by default, this allows transfer of the captured data to the associated application when it comes to the foreground. 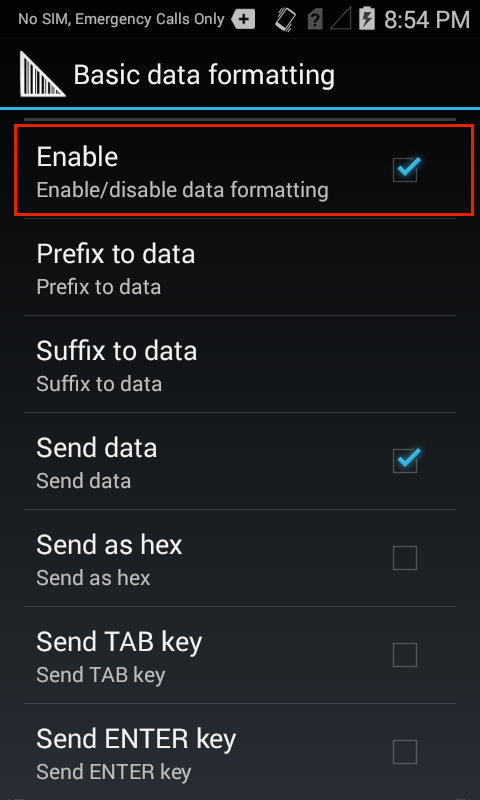 Note: Disabling this option prevents only the captured data from being transferred; any prefix and/or suffix strings will be handed to the associated application(s), even when this option is disabled. Send as hex - sends the data in hexadecimal format. For example, if the acquired barcode data is 012345, this option would send the hex equivalent of 303132333435. Send TAB key - appends a TAB character to the processed data. Send ENTER key - appends an Enter character to the processed data. The Advanced Data Format Process Plug-in allows for acquired data to be customized to suit any requirement based on a set of complex rules containing individual or multiple criteria and actions. For more information, please see the Advanced Data Formatting Guide. The Intent Output Plug-in allows acquired data to be passed programmatically to an application using the Android Intent mechanism. The core components of an application (its activities, services, and broadcast receivers) are activated by Intents. An Intent Object is a bundle of information that describes a desired action. It includes the data to be acted upon, the category of component that should perform the action and some other pertinent instructions. 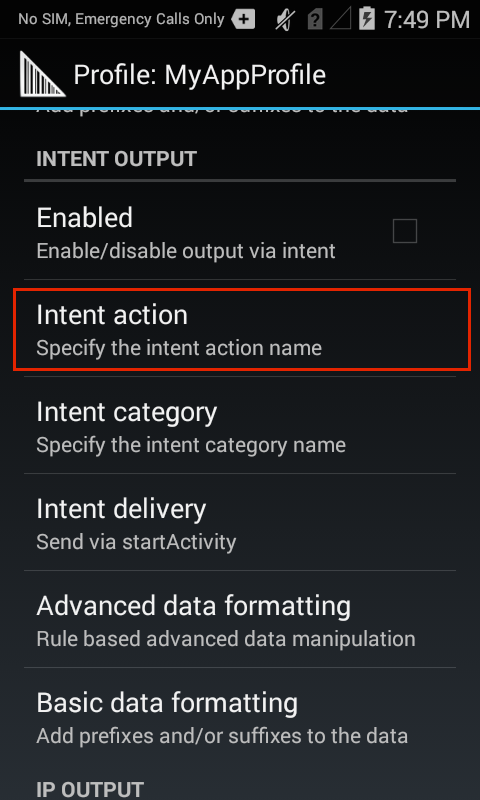 When an Intent is initiated, Android locates an appropriate component to respond to the Intent, launches a new instance of the component (if needed), and passes the Intent Object to it. Components advertise the kinds of Intents they can handle through Intent Filters, which are specified in the AndroidManifest.xml file as <intent-filter> elements. A component may have any number of Intent Filters, each describing a different capability. ...then the Intent Action in the Intent Output Plug-in would be com.myapp.action and the Intent Category would be android.intent.category.DEFAULT. When Intent delivery is sent via Broadcast Intent, DataWedge sets the Receiver foreground flag Intent.FLAG_RECEIVER_FOREGROUND in the broadcast Intent, giving the broadcast recipient permission to run at foreground priority with a shorter timeout interval. This flag is set only when Intent delivery is set to Broadcast Intent. Note: Use this flag only if delays are seen in delivery of Intents immediately following device boot-up. String DATA_STRING_TAG = "com.symbol.datawedge.data_string"; String contains the output data as a String. In the case of concatenated barcodes, the decode data is concatenated and sent out as a single string. String DECODE_DATA_TAG = "com.symbol.datawedge.decode_data"; Decode data is returned as a list of byte arrays. In most cases there will be one byte array per decode. 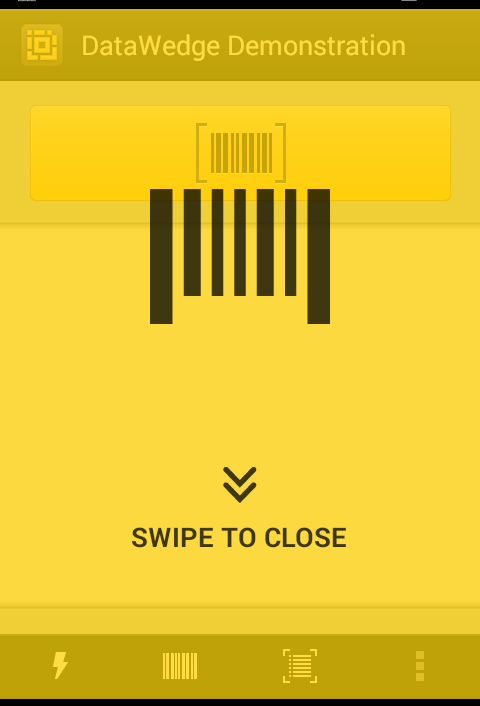 For barcode symbologies that support concatenation (i.e. Codabar, Code128, MicroPDF, etc.) the decoded data is stored in multiple byte arrays (one byte array, per bar code). Clients can get data in each byte array by passing an index. String MSR_DATA_TAG = "com.symbol.datawedge.msr_data"; The data from the MSR tracks is concatenated and sent out as a byte array. The Start/end sentinels and track separators are included as configured. String MSR_TRACK1_TAG = "com.symbol.datawedge.msr_track1"; MSR track 1 data is returned as a byte array. String MSR_TRACK2_TAG = "com.symbol.datawedge.msr_track2"; MSR track 2 data is returned as a byte array. String MSR_TRACK3_TAG = "com.symbol.datawedge.msr_track3"; MSR track 3 data is returned as a byte array. String MSR_TRACK1_STATUS_TAG = "com.symbol.datawedge.msr_track1_status"; MSR track 1 decode status as an Integer where 0 indicates a successful decode. String MSR_TRACK2_STATUS_TAG = "com.symbol.datawedge.msr_track2_status"; MSR track 2 decode status as an Integer where 0 indicates a successful decode. String MSR_TRACK3_STATUS_TAG = "com.symbol.datawedge.msr_track3_status"; MSR track 3 decode status as an Integer where 0 indicates a successful decode. String SIMULSCAN_REGION_BINARY_DATA= "com.symbol.datawedge.simulscan_region_string_data"; Returns the data of the region in the form of byte array. Binary data comes only for picture regions and the form image. Both picture and form data can be load in to a bitmap and display in the application. The IP Output Plug-in enables captured data to be transferred over a network to a computer running IPWedge, a small Windows app made by Zebra. The PC receives the data as keystrokes or in its Clipboard, in essence turning the device into a wireless scanner for the PC. To configure a device to use the IP Output Plug-in, it's necessary to know the IP address of the PC as well as the port number to which the PC will be listening. To set up the PC first, see the IPWedge Guide for IPWedge download and set-up instructions. Then resume from here. 2. 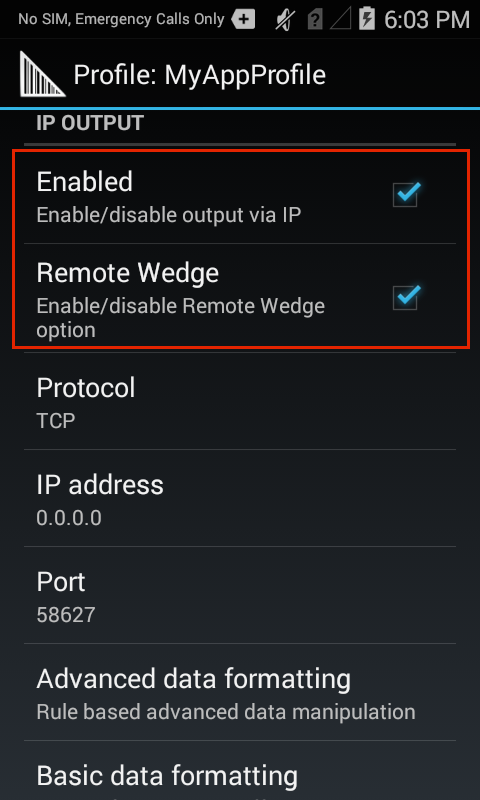 Check "Enabled" and "Remote Wedge" boxes to enable IP Output and communication with the IPWedge server component. 3. Select the desired Protocol for data transport (TCP or UDP) or accept the default (TCP). 4. Enter the IP address of the server running IPWedge software. it is possible to use the IP Output Plug-in to send captured data to a remote device without IPWedge. At the data receiving end, the PC or Mobile device should have a client application that listens to TCP or UDP data coming from the configured port and IP address in IP Output Plug-in. To get IP output plug-in configured to send captured data to a remote computer or device, follow these steps. Data Capture Plus (formerly known as the "Data Capture Panel") enables areas of the device screen to be designated as scan triggers. 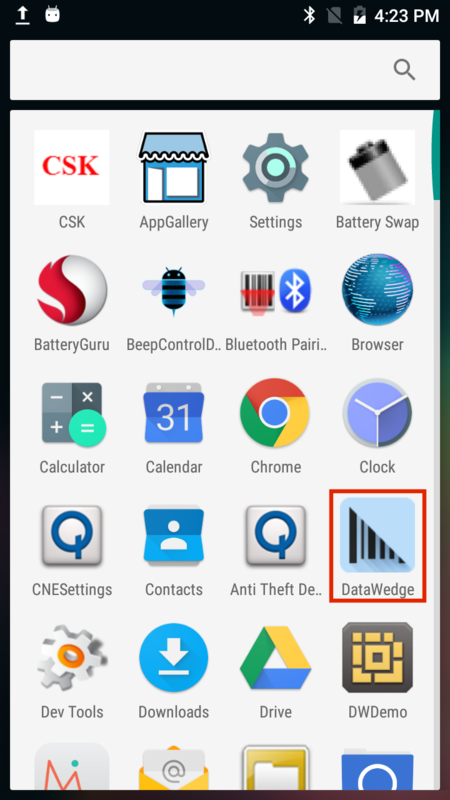 By tapping on a designated screen area, DataWedge will respond as it would to a scanner button-press or other hardware trigger. DCP is disabled by default. The DataWedge Profile configuration screen allows an app user to configure the appearance of DCP on the screen once a particular Profile is loaded. If the user checks the option to enable the DCP, the five parameters shown below appear on the preference screen and can be configured as desired. Note: The DCP will not appear if the scanner is disabled in the current Profile. 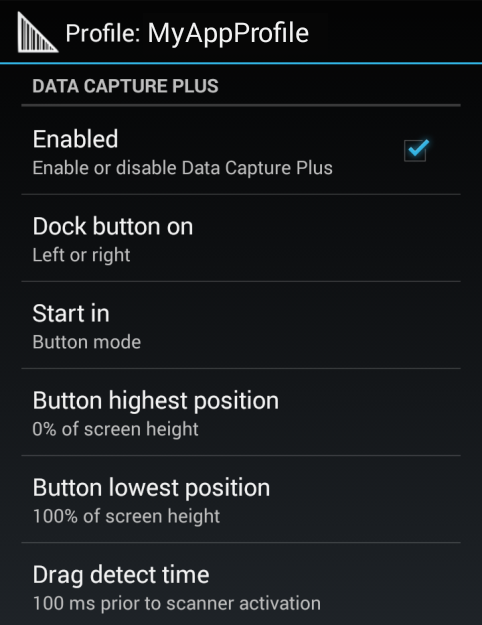 Data Capture Plus options for setting scan triggers. Button highest position - Sets a ceiling for button position expressed as a percent of screen height. For example, on a screen measuring four inches vertically, a setting of 75 (%) would prevent the upper edge of the DCP button from being positioned less than one inch from the top of the screen. Bottom lowest position - Sets a floor for button position expressed as a percent of screen height. For example, on a screen measuring four inches vertically, a setting of 25 (%) would prevent the lower edge of the DCP button from being positioned less than one inch from the bottom of the screen. Drag Detect Time - The wait time (in ms) that DCP should wait after a screen tap before triggering a scanner action. This can help prevent accidental triggers when dragging the DCP button to a new location. Note: A quick touch and release of the DCP can sometimes start the viewfinder when using camera as a scanner. To exit, press the back button. Data Capture Plus shown in minimized mode. Note: If configured to launch as a button, the DCP mode can be changed at runtime by dragging, but the launch state will not be changed in the Profile. However, runtime changes to the vertical position and the docking side of device screen will be saved to the active Profile. Data Capture Plus shown in maximized mode. 1. With DCP enabled, tap and hold the area of the screen designated for DCP. The scan beam (or camera viewfinder) will be active while the tap is held. 2. Aim the scan beam or camera reticle at the barcode to be scanned. DCP will use the preferences configured in the Barcode Input Plug-in for the current Profile. 3. * Release finger to stop scanning or to close the camera viewfinder. Note: A quick touch and release of the DCP control sometimes will start the viewfinder when using camera as a scanner. To exit, press the BACK button.